Live chat software is an optimal solution for webmasters or website owners to provide live online chat communication between support executive and visitors of web site in real time. Since better customer service is the key factor in any business, Live Chat software enables you to provide 24x7 live chat supports to solve queries and problems of your website customers. Advanced live help messenger reduces your phone bills and e-mails volume and increases sales by converting website visitors to buyers. Online customer support utility is useful for wide variety of businesses and organizations including travel agencies, web hosting, insurance, auto sales, web designing etc to improve customer response times and increase customer satisfaction by providing immediate customer service to your web site visitors. User-friendly interface, no technical background or knowledge is necessary. Operator to operator chat - Allows support executives to communicate with other operators to solve customer query in no time. Transfer ongoing chat - Ongoing chat process can be transferred from one operator to other to provide additional information to customers. Support multiple visitor chat - Allows customer support executive to interact with several customers at the same time. Push links or URL’s - Enables operators to push specific web url’s during a chat session. Send Pre-typed (canned) responses - No need to type the same message repeatedly, operators can send canned messages to provide quick response. Visual and sound alert notification - Play sound notification or display pop-up window whenever visitor request to chat. View transcript history - Customer service representatives can view transcripts of previous chat sessions along with detailed visitor information. View visitor typing text - See what the visitor is typing before they send it. 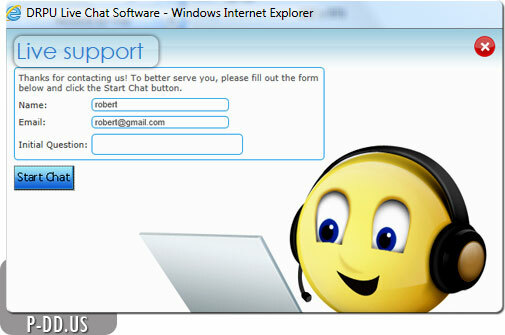 Email chat details - Chat details can be easily send to visitors specified e-mail address to go through the chats later. Leave offline messages - Offline messages can be delivered to customers in case support operator is offline. Create multiple departments - Facilitates to create multiple departments as required by the administrator. Block IP address - Operator can block the specific IP address of any mischief. Backup and restore chat details - Facilitates to keep backup and restore complete chat history details. Provides visitor details- Easily provides visitor name and company along with recent page details. Viewing chat history details - Provides chat history details of every visitor comes to your website.